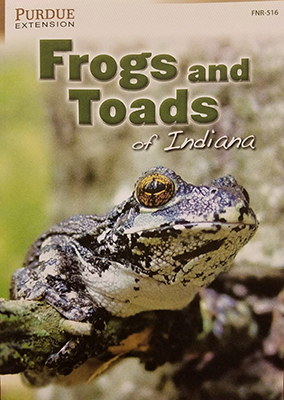 Frogs and Toads of Indiana is the latest and final addition to Purdue Extension’s line of field guides focused on the reptiles and amphibians of Indiana. Readers of this guide will not only learn how to ID the Anuran species of Indiana but will also learn about their distribution throughout the state along with their habits and behaviors. The guide is richly illustrated, filled with interesting facts, and has been peer-reviewed by expert herpetologists.